The Gipsy Fire program follows the album of the same name released in 2014 by the music label Supraphon. It is the continuation of the very successful Gipsy Way, which was the first program of Pavel Šporcl with gipsy motives and theme. It combines great music mastery with gipsy temperament of boiling blood. 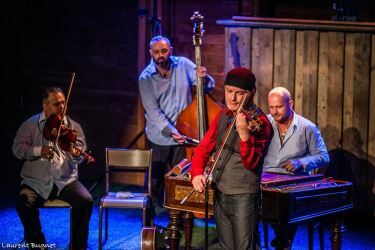 Unlike the first Gipsy Way, the new project is based on the extraordinary technical equipment and the personality of the first violinist Pavel Šporcl who is also the author of the music, including the title track of Gipsy Fire. There was made a recording from the concert Gipsy Fire held in Lucerna which was broadcast by Czech Television in May 2015. The CD Gipsy Way from 2008 as well as the CD Gipsy Fire of 2015 were awarded for sale with Supraphon Platinum Record.